The first thing that we are calling you to is Islam. These Jews are masters of usury and leaders in treachery. They will leave you nothing, either in this world or the next. The ruling to kill the Americans and their allies — civilians and military — is an individual duty for every Muslim who can do it in any country in which it is possible to do it. It would be a sin for Muslims not to try to possess the weapons that would prevent the infidels from inflicting harm on Muslims. We do not have to differentiate between military or civilian. As far as we are concerned, they are all targets. As quoted in Not Popular. It should not be hidden from you that the people of Islam had suffered from aggression, iniquity and injustice imposed on them by the Zionist-Crusaders alliance and their collaborators; to the extent that the Muslims blood became the cheapest and their wealth as loot in the hands of the enemies. Their blood was spilled in Palestine and Iraq. The horrifying pictures of the massacre of Qana, in Lebanon are still fresh in our memory. Massacres in Tajikistan, Burma, Kashmir, Assam, Philippines, Pattani, Ogaden, Somalia, Eritrea, Chechnya, and in Bosnia-Herzegovina took place, massacres that send shivers in the body and shake the conscience. All of this and the world watch and hear, and not only didn't respond to these atrocities, but also with a clear conspiracy between the USA and its' allies and under the cover of the iniquitous United Nations, the dispossessed people were even prevented from obtaining arms to defend themselves. The people of Islam awakened and realized that they are the main target for the aggression of the Zionist-Crusaders alliance. All false claims and propaganda about "Human Rights" were hammered down and exposed by the massacres that took place against the Muslims in every part of the world. English translation of a statement in al-Quds al-Arabi (23 February 1998) "Summary/Review of Reports Concerning Threats by Osama Bin Laden to Conduct Terrorist Operations Against the United States and/or her Allies - 23 February 1998 to 16 June 1998"
Second, despite the great devastation inflicted on the Iraqi people by the crusader-Zionist alliance, and despite the huge number of those killed, which has exceeded 1 million... despite all this, the Americans are once again trying to repeat the horrific massacres, as though they are not content with the protracted blockade imposed after the ferocious war or the fragmentation and devastation. The ruling to kill the Americans and their allies — civilians and military — is an individual duty for every Muslim who can do it in any country in which it is possible to do it, in order to liberate the al-Aqsa Mosque and the holy mosque [Mecca] from their grip, and in order for their armies to move out of all the lands of Islam, defeated and unable to threaten any Muslim. The call to wage war against America was made because America has spear-headed the crusade against the Islamic nation, sending tens of thousands of its troops to the land of the two Holy Mosques over and above its meddling in its affairs and its politics, and its support of the oppressive, corrupt and tyrannical regime that is in control. These are the reasons behind the singling out of America as a target. And not exempt of responsibility are those Western regimes whose presence in the region offers support to the American troops there. We know at least one reason behind the symbolic participation of the Western forces and that is to support the Jewish and Zionist plans for expansion of what is called the Great Israel. Surely, their presence is not out of concern over their interests in the region. … Their presence has no meaning save one and that is to offer support to the Jews in Palestine who are in need of their Christian brothers to achieve full control over the Arab Peninsula which they intend to make an important part of the so called Greater Israel. After our victory in Afghanistan and the defeat of the oppressors who had killed millions of Muslims, the legend about the invincibility of the superpowers vanished. Our boys no longer viewed America as a superpower. So, when they left Afghanistan, they went to Somalia and prepared themselves carefully for a long war. They had thought that the Americans were like the Russians, so they trained and prepared. They were stunned when they discovered how low was the morale of the American soldier. America had entered with 30,000 soldiers in addition to thousands of soldiers from different countries in the world. … As I said, our boys were shocked by the low morale of the American soldier and they realized that the American soldier was just a paper tiger. Any effort directed against America and the Jews yields positive and direct results, Allah willing. It is far better for anyone to kill a single American soldier than to squander his efforts on other activities. We believe that this administration represents Israel inside America. Take the sensitive ministries such as the Ministry of Exterior and the Ministry of Defense and the CIA, you will find that the Jews have the upper hand in them. They make use of America to further their plans for the world, especially the Islamic world. American presence in the Gulf provides support to the Jews and protects their rear. And while millions of Americans are homeless and destitute and live in abject poverty, their government is busy occupying our land and building new settlements and helping Israel build new settlements in the point of departure for our Prophet's midnight journey to the seven heavens. America throws her own sons in the land of the two Holy Mosques for the sake of protecting Jewish interests. I am one of the servants of Allah. We do our duty of fighting for the sake of the religion of Allah. It is also our duty to send a call to all the people of the world to enjoy this great light and to embrace Islam and experience the happiness in Islam. Our primary mission is nothing but the furthering of this religion. ... Let not the West be taken in by those who say that Muslims choose nothing but slaughtering. Their brothers in East Europe, in Turkey and in Albania have been guided by Allah to submit to Islam and to experience the bliss of Islam. Unlike those, the European and the American people and some of the Arabs are under the influence of Jewish media. The International Islamic Front for Jihad against the U.S. and Israel has, by the grace of God, issued a crystal-clear fatwah calling on the Islamic nation to carry on jihad aimed at liberating holy sites. The nation of Muhammad has responded to this appeal. If the instigation for jihad against the Jews and the Americans in order to liberate al-Aksa Mosque and the Holy Ka'aba is considered a crime, then let history be a witness that I am a criminal. Our job is to instigate and, by the grace of God, we did that, and certain people responded to this instigation. Wadih el-Hage was one of our brothers whom God was kind enough to steer to the path of relief work for Afghan refugees. I still remember him, though I have not seen him or heard from him for many years. He has nothing to do with the U.S. allegations. As for Mohamed Rashed al-'Owhali, we were informed that he is a Saudi from the province of Najd. The fact of the matter is that America, and in particular the CIA, wanted to cover up its failure in the aftermath of the events that took place in Riyadh, Nairobi, Dar es Salaam, Capetown, Kampala--and other places, God willing, in the future--by arresting any person who had participated in the Islamic jihad in Afghanistan. We pray to God to end the plight, and we are confident they will be exonerated. There is no doubt that the treacherous attack has confirmed that Britain and America are acting on behalf of Israel and the Jews, paving the way for the Jews to divide the Muslim world once again, enslave it and loot the rest of its wealth. A great part of the force that carried out the attack came from certain gulf countries that have lost their sovereignty. Now infidels walk everywhere on the land where Muhammad was born and where the Koran was revealed to him. The situation is serious. The rulers have become powerless. Muslims should carry out their obligations, since the rulers of the region have accepted the invasion of their countries. These countries belong to Islam and not the rulers. Any thief or criminal or robber who enters another country in order to steal should expect to be exposed to murder at any time. For the American forces to expect anything from me personally reflects a very narrow perception. Thousands of millions of Muslims are angry. The Americans should expect reactions from the Muslim world that are proportionate to the injustice they inflict. The U.S. knows that I have attacked it, by the grace of God, for more than 10 years now. The U.S. alleges that I am fully responsible for the killing of its soldiers in Somalia. God knows that we have been pleased at the killing of American soldiers. This was achieved by the grace of God and the efforts of the mujahedin from among the Somali brothers and other Arab mujahedin who had been in Afghanistan before that. America has been trying ever since to tighten its economic blockade against us and to arrest me. It has failed. This blockade does not hurt us much. We expect to be rewarded by God. We should fully understand our religion. Fighting is a part of our religion and our Shari'a. Those who love God and his Prophet and this religion cannot deny that. Whoever denies even a minor tenet of our religion commits the gravest sin in Islam. Those who sympathize with the infidels-such as the PLO in Palestine or the so-called Palestinian Authority--have been trying for tens of years to get back some of their rights. They laid down arms and abandoned what is called violence and tried peaceful bargaining. What did the Jews give them? They did not give them even 1% of their rights. Hostility toward America is a religious duty, and we hope to be rewarded for it by God. To call us Enemy No. 1 or 2 does not hurt us. Osama bin Laden is confident that the Islamic nation will carry out its duty. I am confident that Muslims will be able to end the legend of the so-called superpower that is America. As quoted in "The Most Wanted Man in the World" (16 September 2001), Time magazine profile. Statement in al-Quds al-Arabi, as quoted in "Bin Laden: I Didn't Do It" CBS News (12 September 2001); also at Positive Atheism's "Big List of Scary Quotes"
Neither I had any knowledge of these attacks nor I consider the killing of innocent women, children, and other humans as an appreciable act. Islam strictly forbids causing harm to innocent women, children, and other people. Such a practice is forbidden ever in the course of a battle. … I have already said that we are against the American system, not against its people, whereas in these attacks, the common American people have been killed. Video statement broadcast on the Arabic-language Al-Jazeera TV station. (7 October 2001). We had notification since the previous Thursday that the event would take place that day. We had finished our work that day and had the radio on. It was 5:30 PM our time. I was sitting with Dr. Ahmad Abu al-Khair. Immediately, we heard the news that a plane had hit the World Trade Center. Undated video released by the US Department of Defense (13 December 2001). 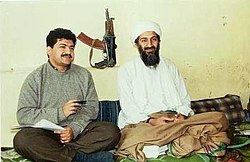 Al-Jazeera interview, (21 October 2001), as reported in "Bin Laden's sole post-September 11 TV interview aired" CNN (31 January 2002). Video statement broadcast on the Arabic-language Al-Jazeera TV station. (26 December 2001). On the September 11, 2001 attacks, in CNN broadcast of an interview that Al-Jazeera conducted in October 2001 (31 January 2002). As quoted in Messages to the World (2005), by Bruce Lawrence, p. 190. Also from 53-minute audiotape that "was circulated on various websites" dated February 14, 2003. "Among a Band of Knights". Audiotape aired on Al-Jazeera (12 November 2002). English translation by MEMRI (Middle East Media Research Institute) of statement by bin Laden (15 April 2004). 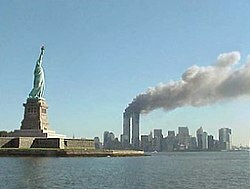 On the September 11, 2001 terrorist attacks, in an audiotape broadcast on Al Jazeera (23 May 2006). "New OBL Tape: Iraq, Democratic Control" ABC News (7 September 2007). Contrary to Bush's claim that we hate freedom. If so, then let him explain to us why we don't strike for example - Sweden? All that we have mentioned has made it easy for us to provoke and bait this administration. All that we have to do is to send two mujahidin to the furthest point east to raise a piece of cloth on which is written al-Qaida, in order to make the generals race there to cause America to suffer human, economic, and political losses without their achieving for it anything of note other than some benefits for their private companies. All Praise is due to Allah. So we are continuing this policy in bleeding America to the point of bankruptcy. Allah willing, and nothing is too great for Allah. You are the nation who, rather than ruling by the Shariah of Allah in its Constitution and Laws, choose to invent your own laws as you will and desire. You separate religion from your policies, contradicting the pure nature which affirms Absolute Authority to the Lord and your Creator. You flee from the embarrassing question posed to you: How is it possible for Allah the Almighty to create His creation, grant them power over all the creatures and land, grant them all the amenities of life, and then deny them that which they are most in need of: knowledge of the laws which govern their lives? We also advise you to pack your luggage and get out of our lands. We desire for your goodness, guidance, and righteousness, so do not force us to send you back as cargo in coffins. Sixthly, we call upon you to end your support of the corrupt leaders in our countries. Do not interfere in our politics and method of education. Leave us alone, or else expect us in New York and Washington. We also call you to deal with us and interact with us on the basis of mutual interests and benefits, rather than the policies of sub dual, theft and occupation, and not to continue your policy of supporting the Jews because this will result in more disasters for you. If you fail to respond to all these conditions, then prepare for fight with the Islamic Nation. The Nation of Monotheism, that puts complete trust on Allah and fears none other than Him. The Nation which is addressed by its Quran with the words: 'Do you fear them? Allah has more right that you should fear Him if you are believers. Fight against them so that Allah will punish them by your hands and disgrace them and give you victory over them and heal the breasts of believing people. And remove the anger of their [Muslims'] hearts'. Mahmoud Ahmadinejad, Speech to the United Nations General Assembly (22 September 2011), New York City, New York. Nasser Al-Bahri, AKA "Abu Jandal," former bodyguard of Osama bin Laden, on Al-Arabiya TV (4 May 2007) as quoted in "Former Osama bin Laden Bodyguard in Al-Arabiya TV Interview : I Love Him More Than I Love My Own Father" (6 June 2007). George W. Bush, as quoted in Ariel Sharon: An Intimate Portrait (2007), by Uri Dan. As a human being, bin Laden may have deserved compassion and even forgiveness, the Dalai Lama said in answer to a question about the assassination of the al-Qaeda leader. But, he said, "Forgiveness doesn't mean forget what happened. … If something is serious and it is necessary to take counter-measures, you have to take counter-measures." Mitchell Landsberg quoting Tenzin Gyatso, the 14th Dalai Lama, in "Dalai Lama suggests Osama bin Laden's death was justified" in The Los Angeles Times (4 May 2011). John McCain, in "Bin Laden’s death and the debate over torture" in The Washington Post (11 May 2011). In America, we have a figure from history from 1897 named Teddy Roosevelt. He was a wealthy man, who grew up in a privileged situation and who fought on the front lines. He put together his own men–hand chose them–and went to battle. You are like the Middle East version of Teddy Roosevelt. John Miller, as quoted in interview with John Miller (May 1998). Osama bin Laden understands that he cannot defeat the U.S. in a conventional war. What he and his allies can do is inflict enough pain to provoke a reaction of the sort we've seen in Iraq–a botched and ill-advised U.S. military incursion into a Muslim country, which in turn spurs on insurgencies based on religious sentiment and nationalist pride, which in turn necessitates a lengthy and difficult U.S. occupation. All of this fans anti-American sentiment among Muslims, and increases the pool of potential terrorist recruits. That’s the plan for winning a war from a cave, and so far, we are playing to script. To change that script, we'll need to make sure that any exercise of American military power helps rather than hinders our broader goals: to incapacitate the destructive potential of terrorist networks and win this global battle of ideas. Barack H. Obama II, as quoted in Audacity of Hope (2006), p. 307. Tonight, I can report to the American people and to the world that the United States has conducted an operation that killed Osama bin Laden, the leader of al-Qaeda. Barack H. Obama II, in remarks on the death of bin Laden - White House transcript and video (1 May 2011). Last August, after years of painstaking work by our intelligence community, I was briefed on a possible lead to bin Laden. It was far from certain, and it took many months to run this thread to ground. I met repeatedly with my national security team as we developed more information about the possibility that we had located bin Laden hiding within a compound deep inside of Pakistan. And finally, last week, I determined that we had enough intelligence to take action, and authorized an operation to get Osama bin Laden and bring him to justice. Today, at my direction, the United States launched a targeted operation against that compound in Abbottabad, Pakistan. A small team of Americans carried out the operation with extraordinary courage and capability. No Americans were harmed. They took care to avoid civilian casualties. After a firefight, they killed Osama bin Laden and took custody of his body. Barack H. Obama II, in remarks on the death of bin Laden (2 May 2011). In May 2011 the United States finally got bin Laden. I felt a great sense of relief and pride as well as gratitude to President Obama for the bold decision to launch the raid that had led to the killing. And I felt vindication for putting into place many of the tools that had led to that day. I always believed that we would get bin Laden. We should give him credit for only one thing: unlike other vile tyrants, he did not live in golden palaces, but avoided them. Gabriele Romagnoli, Osama: Quando Muore un Fantasma, Vanity Fair (11 May 2011). 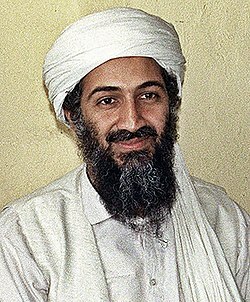 On the existential plain, Bin Laden was marginalized, out of play, but inside the chrysalis of myth that he had spun about himself he was becoming a representative of all persecuted and humiliated Muslims. His life and the symbols in which he cloaked himself powerfully embodied the pervasive sense of dispossession that characterized the modern Muslim world. In his own miserable exile, he absorbed the misery of his fellow believers, his loss entitled him to speak for theirs, his vengeance would sanctify their suffering. Lawrence Wright, The Looming Tower. In what people irritatingly call "iconic" terms, Bin Laden certainly had no rival. The strange, scrofulous quasi-nobility and bogus spirituality of his appearance was appallingly telegenic, and it will be highly interesting to see whether this charisma survives the alternative definition of revolution that has lately transfigured the Muslim world. The most tenaciously lasting impression of all, however, is that of his sheer irrationality. What had the man thought he was doing? 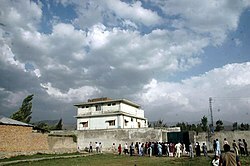 Ten years ago, did he expect, let alone desire, to be in a walled compound in dear little Abbottabad? 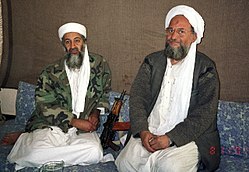 ... What happened in Abbottobad … has been the second death of Osama bin Laden. His physical one. Meanwhile, his symbolic, political and ideological [death] had already occurred on the squares of Cairo, Tunis, Damascus and Bengasi, where al-Qaeda had been ignored. Nobody exhalted it. Nobody mentioned it. The "Arab spring" has blossomed and exploded for want of democracy and freedom. It is not provoked by Islamic fanaticism, and even less inspired by the idea of a caliphate... launched by bin Laden. It is not a choice. It is outdated, even if its sporadic followers are still able to strike. Before the Americans, bin Laden had been symbolically killed by the people on Tahrir square and Burghiba avenue. Bernardo Valli, in "Il giovane viziato con lo sguardo timido diventato il 'principe del terrore': I soldi del padre e la svolta nella lotta contro l'Urss in Afghanistan" in La Republica (3 May 2011). Transcript: Full Text of Bin Ladin 4 January Audio Message (4 March 2004). This page was last edited on 31 January 2019, at 18:34.